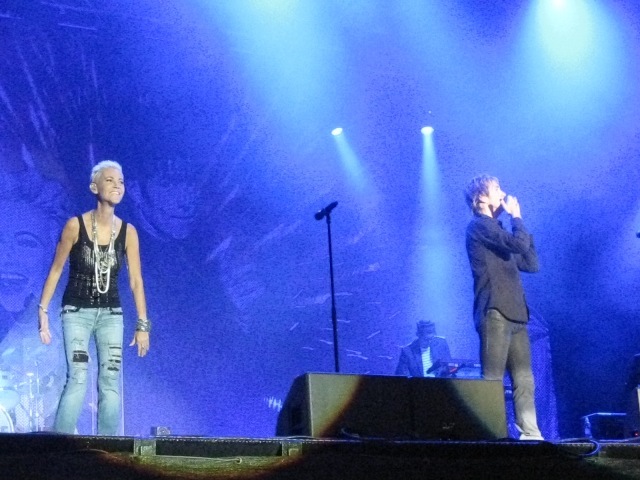 Almost ten years – so long the fans had to wait until Roxette had a new concert at Vienna arena. The fact that this was possible last Monday was a real wonder. Because the singer Marie Fredriksson needed a long time to recover after the brain tumour. The fans celebrated this perfect comeback show in a crazy way. "We forgot this one!" – "But we haven’t forgotten this!" Exactly at the end of the concert the guitar player Per Gessle showed that he didn’t lose his smile and turns the fans hot for an extra moment: "Listen To Your Heart", one of the biggest classic songs from Roxette. There is a very good mood once again for everyone. PER Gessle deliberately evaded the past. 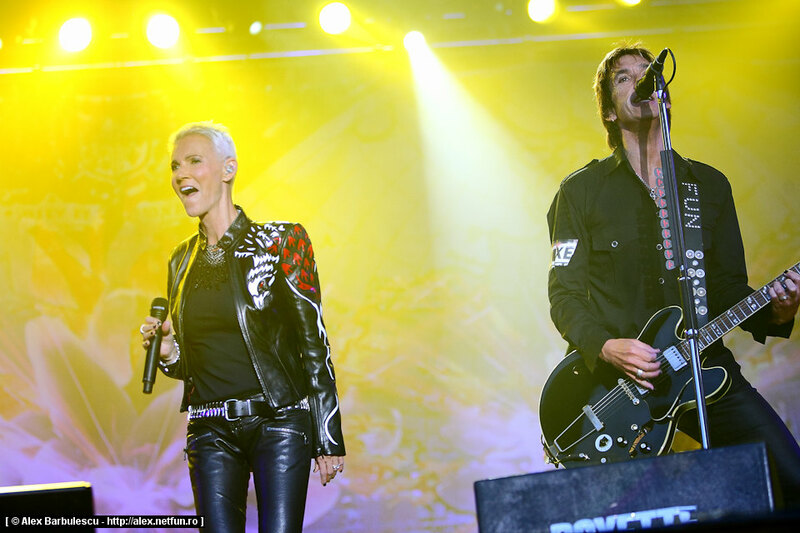 "I stopped writing Roxette records," Gessle says. "I avoided it to become myself again." 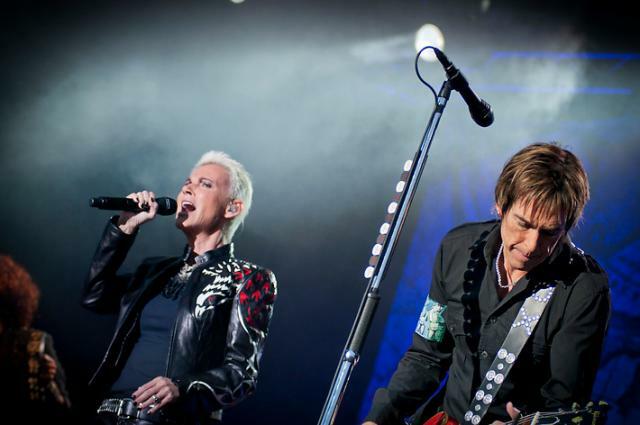 Roxette, the Swedish pop duo of Gessle and singer Marie Fredriksson, dominated for a decade with hits including The Look, It Must Have Been Love, Listen To Your Heart and Joyride, before illness halted them. In 2002, Fredriksson was diagnosed with a brain tumour. After surgery, chemotherapy and radiation treatments, she won her fight against cancer three years later. Meanwhile, Gessle and Fredriksson released solo records. Two years ago, during a solo show, Gessle asked Fredriksson to join him on stage to sing The Look and It Must Have Been Love. "To be honest, she was nervous and didn't have that self-confidence," Gessle says. "But the reception she got was amazing. People were cheering and crying. They knew it was special." The group has had the only summer concert in Sweden this year. HALMSTAD. Roxette have already started recording a new album. At the same time the band adds more concerts to the successful world tour that has started earlier this year - and continues in a big part of 2012. - We have already started to record new songs for our next album that will be a continuation of "Tourism", says Per Gessle. 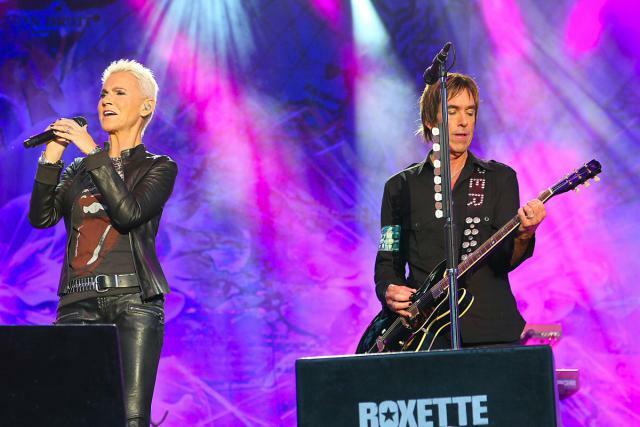 Per Gessle, Marie Fredriksson and the rest of the "new" Roxette have got 10 days holidays from the huge tour where they have played in front of an audience between 10 000 and 20 000 in South Africa, Russia, Middle East, South America and Europe. We meet Per Gessle at the inauguration of photoexhibition with Terry O'Neills classical photos of the 60s at Tres Hombres Art in Tylösand. The tour has worked better than expected. At home, in Sweden, it is difficult to understand the band's new future and the position on the lists of the single "She's Got Nothing On (but the Radio)" from the comeback album "Charm School". Roxette, we've got wet up to our socks! There are four signs that make you realize that a group fools sometimes the audience from the East, who are more enthusiastic, by doing a real playback. A kind of pop-rock star from the ’90s, for whom you used to cry during your teen-age without any hope and until 2007, when some rockers started to appear in the neighbourhood, quite old guys. Roxette fans in Romania have been waiting since the 90s to see their favourite band on stage in Bucharest. On Monday evening, when the concert in Romania finally happened, Romania-Insider.com was there to enjoy it… and then to spread the word about it. 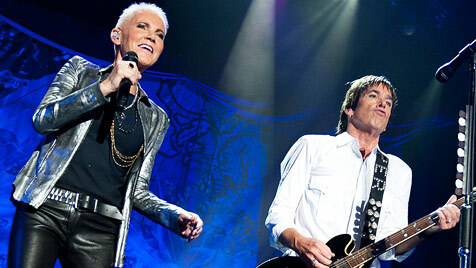 Swedish band Roxette threw an unforgettable first time concert in Romania on Monday evening. After years of waiting, the Romanian public had a chance to listen to the band which used to be very popular locally in the 90s and which, judging by the closed box office, still enjoys a great deal of fans. And it was an unforgettable evening for the band too. “Just came back from a super show in Bucharest. What a crowd!!! We have the best fans in the world!!!! Had a blast. And Marie is saying THANK YOU to everyone singing Happy Birthday To You!!!!! We have to come back to this place pretty soon!!!! !”, wrote the band on their Facebook page soon after the concert. While we are waiting for the Bucharest show, take a look on this story published in the Romanian magazine “Pop Rock & Show” in July 1992. Here, Carmen Olaru writes about her experience at the Roxette concert in Budapest on the 8th of July 1992. While there have been, as for Guns N 'Roses concert, organized trips in Budapest to the Roxette concert, I have decided to travel on my own. It is true that a trip Iasi-Budapest and back is not really handy, since this effort is both financially and the fatigue accumulated in such a path. But I assure you it worth it! And not just because I was the first time in a show of this magnitude, with a precious band, but that Roxette has not cheated the fans, but on the contrary. But until I get to the impression that it would be better to tell something about the atmosphere. July 8, at 20, Kisstadion, in the immediate vicinity of the "big brother" Népstadion attracts viewers of all ages ( I've seen whole families coming to the show, children, adults) who come from different corners of the capital. They come by subway and even if they don`t know the area, the place is very easy to hit: everyone circumvents the big stadium and have a precise direction that I follow too. Many cars, buses around the area, merchants with all sorts of products invite you to stop for the juices, beers, or their sandwiches. We orderly enter the stadium, we are not asked for equipment, umbrellas, etc.. (as in other shows) and on the back of the entrance-ticket are written those things . I could find inside the stadium Roxette shirts, discs and cassettes "Joyride", some posters obviously with the price for fans. I'm impressed again, as in any store that i previously visited by the kindness of a lady from the organizing team. She is about 45 years old and do not hesitate to lead me to the place written on the ticket, she understood that i`m probably foreign to the area. The place that I have is very good (950 ft), giving me the opportunity to see and hear everything very well. I`ve had a 5-10 minutes delay and missed the first part of the show of the opening act: a band with six people (probably swedish or british) who played for 20 minutes. It sounds bad, but everyone expects Roxette. However, the conscientious people in front of the stage they are getting warm singing with these guys too. The time for Roxette installation team gives me the opportunity to "shoot" what's around. The stadium is almost full (except for a lawn to the left of the stage, which I believe did not offer vision and platform in the opposite side of the stage, the farthest); on the lawn compact group of fans are dancing to the music offered by the organizers, even if it`s not Roxette, but Queen, Genesis, Right Said Fred and The KLF. The guard-team makes its presence felt through serial extraction of those who, being in the first row in front of the stage, risks to stop breathing because of people pushing from back. Figure this is repeated throughout the show so do not get to impress me. After a recent U.S. tour with plenty of initial emotions, but ultimately ended as a big celebration, those who have charmed American audiences have played again for their dearest - the european fans and it`s expectations have not been cheated! Having a great sound, an excellent lighting effects, these two swedish who, according to the american press are not able to sustain a show, delighted the audience. Accompanied by six musicians, Per and Marie were able to win without the kind of audience, like the other bands, the fireworks, forced dialogue with gym, directed impulses to sing or dance. Everything was so natural, naturally and spontaneously, that I was convinced again that they live and attract fans only through their music. They started with Hotblooded, after which followed another 13 songs combining new material with known hits: Dangerous, Spending my time, Fading like a flower, Dressed for Success, Big L, The Look. As expected, the high public reception was the "It Must Have Been Love", preceded by an excellent voice sample (without accompaniment) of Marie. At 22.10, after a particular effect due to two "fountains of fireworks” from the stage, we were simply said" Good night "but no one moved away. It was weird to miss from the show just the song ”Joyride” who Marie thought that will not be successful in America. After 10 minutes of applause I got what I wanted, but not in any way, but together with six huge colorful balloons thrown at the public (exactly when Per was singing about balloon). But it is not enough: other stage re-entry, two other songs we enjoy, especially as neither Listen to your heart could not miss. But at 22.35 everything was over! I haven`t seen at the stadium the bad-behaviour from other band`s fans, the Roxette fans have been warm, sang, danced, lit lights, there were permanently shaken some fluorescent rods ("only" 250 Ft / piece) which created a great stadium picture. Near me, two teenagers, a girl and a boy were standing holding their hands and sang the whole time. Although type of “nerds" at first glance, the young fans have shown real head-tail humming songs and proving that they have had time to learn the words. As they loved Roxette, i`m sure that from now they will love them even more than before! And this because these two just “released” in 1989 by Minneapolis Radio DJ Dean Cushman are not at all difficult to love! At the exit "fight" was given to buy poster of the show and some other posters. But I counted the money again and I said "Okay as I saw them live." I walked past people waiting at the bus arrival and departure of artists considering that I am so richer in my soul (at least that night). That evening I was billionaire-soul for 1 hour and 35 minutes!